This past January was a major milestone in the history of our agency. After 33 years of working with families, communities, institutions, and businesses to resolve conflict through mediation and constructive dialogue, our Founder, Mark Kleiman has transitioned into retirement. We are excited for Mark to enter into the next stage in his life and extremely grateful to have had the opportunity to work with such a visionary and innovative leader. 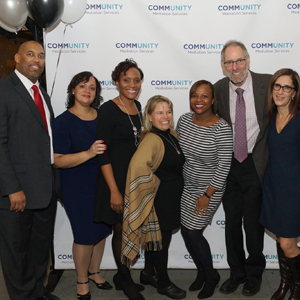 On December 8th we celebrated Mark and CMS’ accomplishments over the past three decades at a retirement event in his honor. Thank you all who attended and for your generous donations to the agency. As we look ahead to the rest of 2017 and beyond, your continued support will be essential in order for us to carrying on Mark’s legacy. If you were not able to attend or haven’t yet made a donation in Mark’s honor, you can visit our Donation page by clicking on the Donate icon on the top right hand side of the screen. Mark hands over the reins of the organization to two highly capable leaders, our new Chief Executive Officer, John Harrison and our new Chief Operating Officer, Stacey Siff. Of course, just because Mark is retiring does not mean he will be a stranger. Mark will continue to be a presence at CMS and offer his support during and after the transition. Both John and Stacey have been integral components of CMS’ success for many years at the programmatic and managerial level. Under their leadership we are all excited to honor Mark’s legacy by continuing to find new ways to help youth, families, and communities constructively address conflict throughout Queens and the rest of NYC. To learn more about or contact our executive team visit our Founders Statement and Meet the Team pages under the About Us tab.